The Holy Monastery offers many styles and designs for guest favors that are unique and feature traditional Byzantine icons. Consider ordering the wonderful handmade gifts for your next wedding, baptism, shower, anniversary or feast day event! for the handmade specialty candles available. The selection of guest favors has been divided over four web pages. 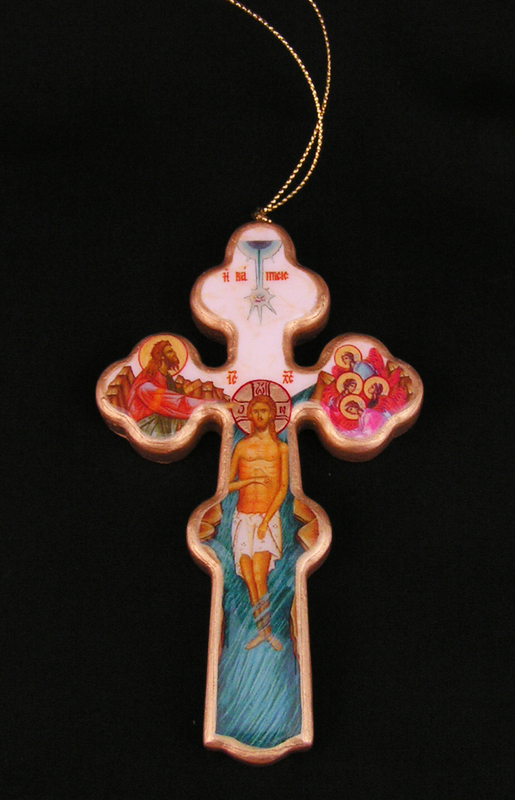 Items include small wooden icons in different styles and shapes as well as mineral and stone icons. You might also consider the Handmade Soaps & Lotions, Circular Icons, or even Christmas Ornaments as gifts for your guests! Also consider unique gifts for your Koumbari, Godparents and other VIP's attending your special event! 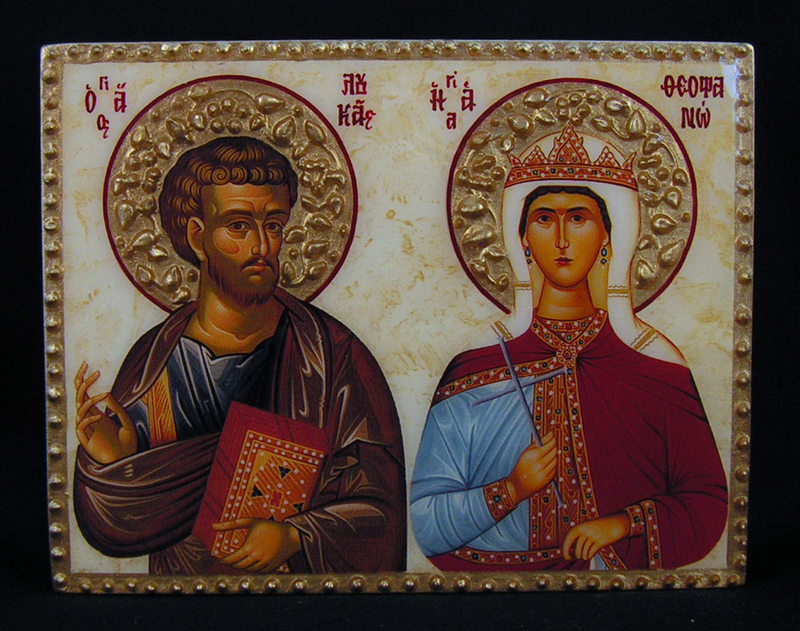 A wide range of icon images of Christ, Panagia, and most Orthodox saints are available. Included in the item descriptions is the BASE PRICE for that item. Additional charges may apply to each item if you request special decoration or materials to be used and will be quoted when you receive order confirmation. DECORATIVE BOX - Add $1 to the base price for each favor to include a decorative box to present your gift to your guests. 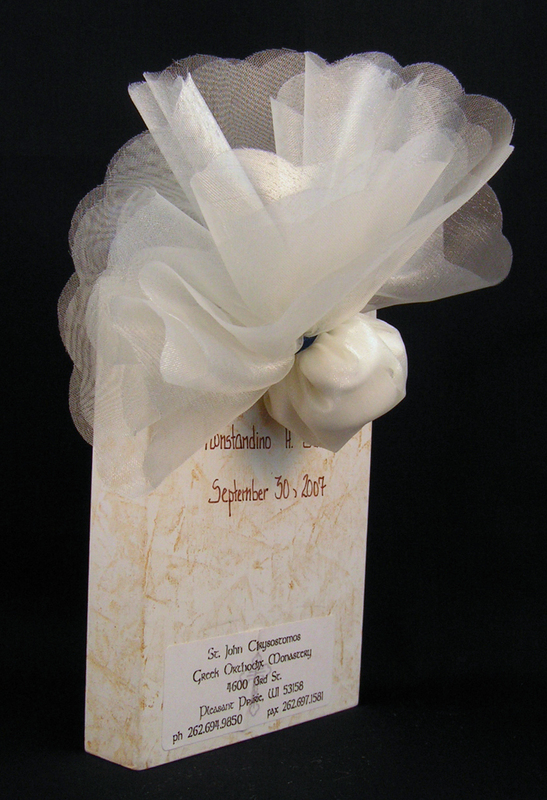 PERSONALIZATION - Hand written name and date can be added to the back of the guest favor to mark the special occasion. Please specify Greek or English on the order form and write out the name and date in the "Additional Notes" section of the order form. Add $.50 - $1 to each item. ADDITIONAL SAINTS - Add icons of other saints to your guest favor. This would be a nice touch for a wedding (patron saint of the bride and the groom), an anniversary (patron saint for the husband and wife), or even a baptism (the patron saint of the godparent and godchild). Add $2 to the base price of each favor for each additional saint. The Item ID (for example "FAVOR #1") along with a short description. The number of items you need. If the item has hand painted lettering included, you may specify Greek or English if you have a particular preference. Information on when the event is to be held as well as any other information important to completing your order. Details: Icon of Saint Eleni by herself. Add almonds/netting (ivory with scalloped edge) and a gift box. Baptism is October 11th. This order has a base price of $10 per icon plus $1 per icon for the almonds and $1 per icon for the box. Each icon would be individually wrapped with almonds and, therefore, would be $12 per piece in this illustration. Below are photos of some examples of the many choices available.